Ismene is a production presented by Toronto’s Socratic Theatre Collective and written by Jeremy Menekseoglu that takes a modern look on a classic Greek Tragedy. Ismene, the famed daughter of Oedipus and Jocasta and sister to Antigone, is sent to the Arktoi School for Unruly Girls after her participation in her sister’s rebellion. Outside the school’s walls the Chorus howls demanding that Ismene complete her family’s tragedy. Inside she bonds with other women from mythology who have fallen victim to tragedy and fate. There is something quite remarkable in how this production unravels before the audience and it begins with the integration of the audience into the show. We start outside on the steps of the Marshall McLuhan CSS where a frightened Ismene, tattered and torn, is standing on the edge of what we learn is the side of a mountain while Erin, another unruly girl, forcefully goads her inside the school. We then follow the girls inside to the front foyer which serves as the entrance to the Arktoi School. There we meet Procne, the no-nonsense head mistress who does quick work of putting Erin in her place by first requesting her draw a bath for their new student. It is at that point that Erin notices the audience standing around. “Whose audience are you? Ismene’s audience? Who is she to you?” She demands. The audience is then lead to its seats for the rest of the play where the talent and raw emotions of the performers carry the audience along for the ride. The show was, simply put, remarkable. Whether or not you are a fan of Classical Greek theatre, this was a show that anyone could appreciate. Though taken out of the period of ancient Greece, the imagery of battered women in a shelter cannot be mistaken – women who fight their own internal battles as to whether this is the life they were meant to live or if they have it in them to fight back. I took my friend Derek with me to see the performance and though he is a fan of live theatre, this was his first introduction to Classical Greek theatre, albeit a modern take on a classical story. Being a modern interpretation, the language is current so it’s a lot easier to understand and helps to bring the story home. But what drew him in and kept him locked was the unique use of audience as not just voyeurs unbeknownst to the characters but as an integral part of the whole story. We are Ismene’s audience and we travelled with her into the school where she is forced to face her own past. We are there to bare witness to her struggle and we are therefore left feeling a bond and kinship with her to the end. This production of Ismene is part of The Ismene Project, where seven cities put on their own production of the show at the same time (the month of May), all directed by female directors, with proceeds from at least one show sent to a breast cancer awareness charity of the director’s choice. In Toronto, our Ismene was directed by Liz Bragg and the proceeds from two performances went to support the Gilda’s Club of Greater Toronto. 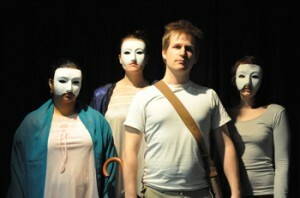 The run for Ismene has come to a close but stay tuned for the 2011-2012 season for The Socratic Theatre Collective, Death, with The Dark Room in Fall 2011 and Mort in Spring 2012.